Sonric's Rockaleta Lollipops is a tasty treat that will leave your tongue tingling with flavor. 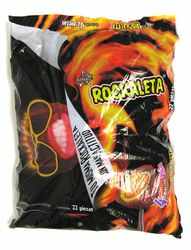 Rockaleta's are spicy multi colored, layered and flavored lollipops with a delicious mango-bubblegum center. Its literally bursting with a tangy flavor that will make you experiment multi-sensations. Ingredients: Sugar, corn syrup, gum arabic, iodized salt, gum base, citric acid, chili powder, flavorings and artificial colors. Los Rockaletas de la marca Sonric's son unas paletas deliciosas que dejaran tu lengua zumbando de sabor. Las Rockaletas son unas paletas que contienen una combinacion autentica de multicapas de sabores y colores ademas de un rico centro de chicle con sabor a mango. Estas golosinas estan repletas de un sabor picante que te hara experimentar multisensaciones deliciosas. Ingredientes: azucar, jarabe de maiz, la goma arabiga, sal yodada, goma de mascar, acido citrico, polvo de chile, sabores y colores artificiales. I am addicted to these flavors! Sweet tamarind, salty, chile, lime, all wonderful flavors in one candy. I will definitely buy these again. I am a senior citizen but never too old for lollipops. First ate one in Sonoyta, Mexico on a children's mission trip.